Most people are not aware of the fact that 84% of the European crops are partially or entirely dependent on insect pollination. While managed honeybees pollinate certain crops, wild bees, flies and wasps cover a very broad spectrum of plants, and thus are considered the most important pollinators in Europe. The serious decline in the number of managed honeybees and wild bees reported in Europe over the last few decades has the potential to cause yield decreases with threats to the environment and economy of Europe. The future of the pollination services provided by bees is therefore of serious concern. Effective actions for the mitigation of the pollinator declines need to be taken across Europe. Although honeybees are important pollinators in large scale plantations, for some crops, including sunflowers, a combination of wild bees and honeybees are essential to provide optimal pollination. Wild bees can support farm productivity when the honeybees can't do the work, for example when their number is insufficient, or when weather conditions prevent them from flying. Moreover, it is well known for several crops, that wild bees are more efficient at pollinating than honeybees, such as mason bees on apples and bumblebees on beans. In addition, wild bees can be a lower cost alternative to honeybees since they do not need to be rented commercially if sufficient high quality pollinator habitat is available in and around farms. To raise awareness among farmers for the importance of wild pollinators, the EC FP7 project STEP – 'Status and Trends of European Pollinators' published a farmers' factsheet in 15 European languages. The factsheet encourages farmers to utilize the benefits of wild insect pollination services, and thus reduce the risks of relying on the honeybee as a single species for crop production. 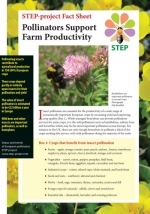 Farmers are encouraged to take actions to protect pollinators by selecting appropriate agri-environmental schemes and modifying agricultural practices to become more pollinator friendly.Simultaneously, STEP is undertaking a broad-scale survey of the public opinion through online questionnaires available in seven European languages. The survey aims to reveal if, and to what extent, people are aware of the role of pollinators in agricultural ecosystems and the consequences for the environment from the decline of bees and other insect pollinators. People are also being asked to give their opinion on the importance of insect pollination for agriculture to share their perception on the status of pollinators in Europe, their importance for public health, wildlife and the European economy and how important they believe this issue to be. Readers of all nationalities are invited to express their opinions through this online survey.